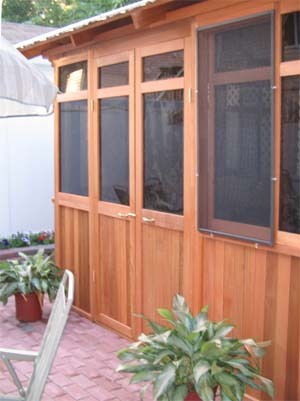 Pacific 12'x12' is our Queen size Spa Enclosures. It will house any spa up to 8 sq.ft while still leaving plenty of space for dressing and recreations. 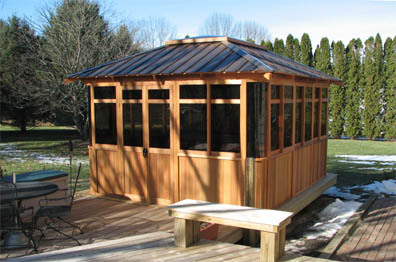 With the protection and privacy provided by this spa gazebo, you can relax quietly and peacefully in the hot tub all year round. Doors: two hinged doors create a opening about 4 ft wide and nearly 7 ft high. The hinged doors are easy to operate. Roof: there are 8 pieces of roof panels pre-built with tarpaper shield, wood base and mahogany plywood ceiling. The roofing material is colored steel metal (pre-installed on the roof panels). 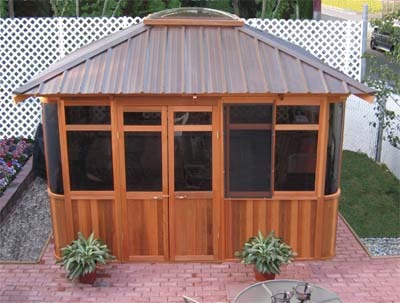 Wall dimension: outside 144"x144", inside 137"x137"
Metal wood roof: Brown, Green and Blue color choices. 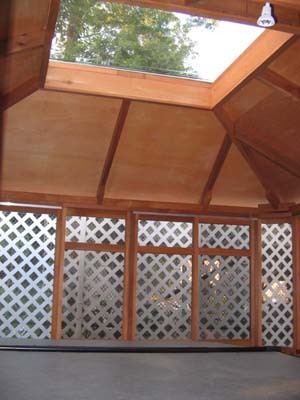 This Spa Enclosure is made with metal roof. It is very strong and durable. The ceiling is mahogany wood. You can't see the metal roofing. The skylight is 4'x4' tinted Dome. You don't worry about mosquitos & bugs even the windows open in Summer and night.